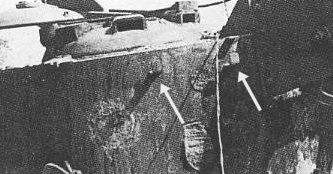 This photo of the "Bergepanzer Tiger" shows two small hooks welded to the turret wall, beside the winch. These hooks were added for the "charge laying" role, but we don't know their exact purpose. Above the right-hand hook there is a tab; this used to hold the turret bin and is not related to the vehicle's new function. These hooks are not represented in any model kit.